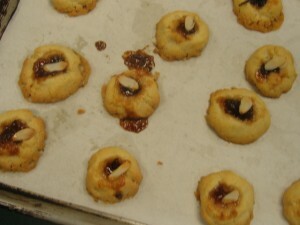 Day 11 The Plum Almond Drop Unlike a plum pudding this almond drop cookie actually contains plum in the form of preserves spooned in the middle. When I baked them they flattened out a bit more than I would have preferred. I think the reason is I got impatient and added a bit more butter than the recipe called in order for the dough to come together more quickly. So what this prototype cookie lacks for in aesthetics it makes up for in richness of flavor.